Successfully Added Finger Print + Access Code Dead Bolt Door Lock (Right) to your Shopping Cart. 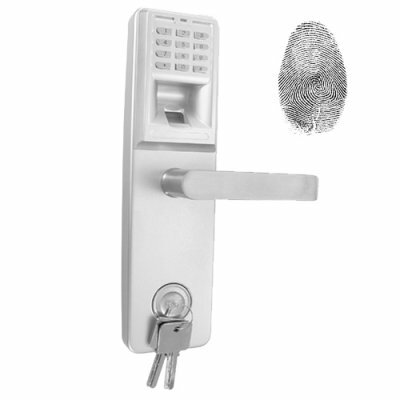 Double action fingerprint and access code security door lock for your office, business or home. Get 100% security at your entry point with this presidential style deadbolt double action lock. This is one of the best and most secure methods in assuring only authorized people can access certain rooms in your office building or any other designated room of your choice. Anyone needing access to a room with classified information, be it company, personal, commercial or even government, will have to place their finger on the fingerprint sensor and/or punch in the admin-generated code to unlock this super heavy dead bolt lock. The beauty about this fingerprint door lock, lies in it's flexibility in allowing either access code or fingerprint use individually or simultaneously. What you get with this fingerprint door lock is complete peace of mind with a guarantee of 21st century security, meaning this lock cannot be picked or hacked. If no one is authorized to have access, then they will never be able to gain access. Since the CVJJ-G97 can be installed on wood or metal doors that are industry standard 40-50mm thick, it is perfect for almost every office and home entry. In addition to total security, this superb fingerprint security lock looks super cool and will compliment most office decor. With an unbeatable factory direct wholesale price, you get great value and an amazing presidential style security fingerprint lock. Get yours today to try from the leader in wholesale electronics, Chinavasion. Note: It is important to carefully read the manual before installing and operating this fingerprint security door lock with access code function. How can I access the keyhole when there is a magnetic plate cover over it? Provided with the keys is a suction cup attached to the key chain. You can use this with easy to remove the magnetic plate to reveal the key hole. Yes, you can store up to 99 additional fingerprints. How many codes can I register with this fingerprint security lock? You can register a maximum of 2 access codes. No, The CVJJ-G97 is weather proof. Meaning any moist build up from fog or frost should be fine. It is not advised to install the CVJJ-G97 in un-sheltered areas where direct contact with rain, hail, or snow is likely. Photos & Graphics By: T.L. on 2011-07-08 09:41:01 A great product for sale! A great product for sale! I think this is a product that should return the virtual shelves of fine chinavasion.